Today we are interviewing Robert Moment about his book, "How to Be Happy- Life Coaching Strategies and Ideas to Be Happy in Life and With Yourself." Tell us about your new book, "How to Be Happy- Life Coaching Strategies and Ideas to Be Happy in Life and With Yourself." I wrote this happiness book because so many people struggle with being happy with themselves and self love. One of the first life coaching questions I ask the reader - “When was the last time you felt and truly experienced sustainable and real happiness in your life?”. I ask the reader to be 100% honest with their answer. Happiness is a choice. One of the greatest life coaching lessons of this book is to show the reader the mirror and teach them how to love themselves and be happy when they see themselves in the mirror as a precious Gift to this world. What advice do you hope readers take away from reading the book? Happiness is not an emotion but a state of mind. I want the reader to know that everyone deserves to be happy. 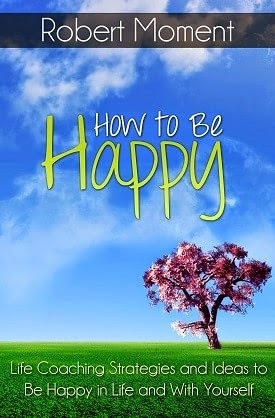 Throughout this book, I’ll help you take the steps you need in order to achieve greater happiness in your everyday life. I’ll not just tell you about those steps, but I’ll show you how those steps can get you from here to there. What do you think is the biggest challenge trying to finding happiness in life? We need to ask ourselves the right questions and define what happiness means to each and everyone of us. I help the read create their own 'happiness formula'. Try this coaching exercise: get a piece of paper and try to write a description of how you really feel about yourself this very moment. It doesn't matter whether it's 30 words long or 800 words; the key is to describe how you're feeling about yourself at this moment. Use that piece of paper to get rid of your negative emotions. Get rid of that confusion or that doubt, the conflict, or the pain. Whether you verbally express your disappointments, discouragements, or negative feelings or you prefer to write them down, get them out. It's time to clear your mind and develop a wellness plan for your mental and emotional health. The goal of this book is to help you along on your journey to creating a stronger sense of yourself that will create a better "outer life" for you on a daily basis. What advice would you give someone trying to find happiness? As a life coach I would coach someone trying to find happiness by asking them the right questions. In this happiness book I have a chapter with powerful questions that will help the reader find happiness and meaning in their lives. Why are you unhappy with your life? What are 5 keys to being happy that could help someone right now? What 5 benefits will the reader get when they read your happiness book? Learn how to discover everlasting happiness by loving yourself FIRST. Powerful questions will help you not only find happiness, but also help you find your true meaning and passions in life. Learn the amazing 10-Step Happiness Formula to create your own abundant happiness no matter how unhappy you may currently feel in your own life. Find out why being happy “from the inside out” is the TRUE SECRET to expand your own happiness in all areas of your life. The choice is yours to make. Discover the KEY PRINCIPLES that fuel happiness and learn how to tap into these principles on a regular basis to feel utterly excited to be alive and live the way you want to live. You'll discover all the essential elements to happiness plus so much more in this easy to read happiness book that has the power to TRANSFORM YOUR ENTIRE LIFE !